It's beginning to look at lot like Christmas! At least in my office. 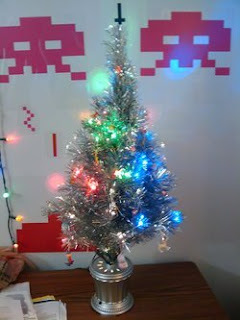 The shiny silver tree is currently in my office. And yes, those are big Space Invaders on the wall behind it. The tree only lives there during the holidays. The Space Invaders are a permanent attraction. Lucky for me they don't seem to multiply! I *heart* this time of the year. I tend to treat the month of December as a month-long celebration, with occasional breaks for work in between. One of my favorite holiday activities is reading Christmas themed books. I'll read just about any book if it's got Christmas in the title, but some of my favorites are in the sci-fi/fantasy arena. These also happen to be some of the geekiest :) Here's a few of my favorites. Miracle and Other Christmas Stories is a collection of short stories by the sci-fi author Connie Willis. This was my introduction to sci-fi holiday stories, and I was immediately enamored of the sub-genre. I love the blend of our current traditions and Christmas cliches, with the science fiction elements. Willis' parting remarks are not to be missed either. Among them she suggests a number of Christmas movies and additional Christmas reading. It was through that list that I discovered the wonders of P. G. Wodehouse's Jeeves and Wooster stories, and Michael Moorcock's Behold the Man. The books Christmas Stars and A Yuletide Universe: Sixteen Fantastical Tales are also collections of short stories. This time, by a variety of authors. Christmas Stars contains Christmas stories mostly dating from the 1950s through the 1980s, with a few from more recent times. A Yuletide Universe is more modern, with most of its stories coming from the 1990s and up. Either way both of these contain reprints, so if you read a lot of sci-fi short stories, you may have seen these before. Last but not least, is the comical Santa Claus Conquers the Martians. When I saw this book in the bookstore I was determined to read it by the title alone! This one is the adaptation of an apparently very bad movie by the same name. I can't say if the movie is worth watching or not, but the book is pretty funny.